Continuing with my Charlotte, NC Travel Guides for this month's Tuesday blog post series! 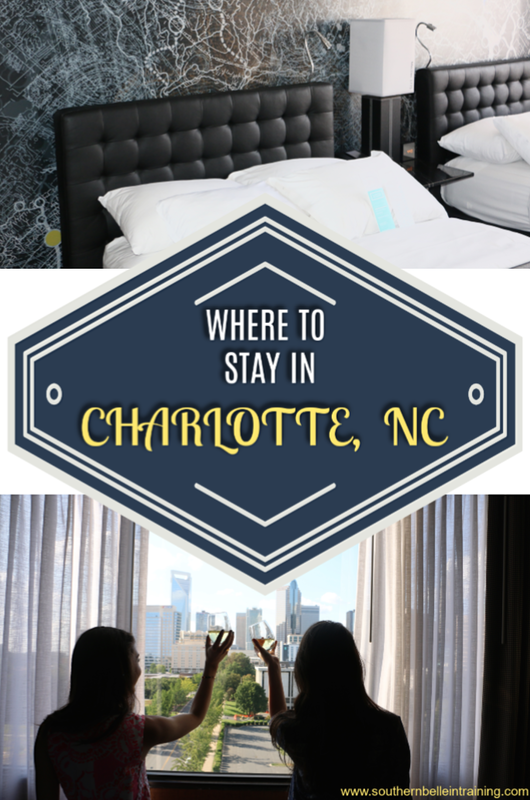 Today I'm sharing four Charlotte hotels that I've stayed in, and would definitely recommend to anyone visiting the area! Two are very budget friendly, and the other three are a little bit higher end, so there's an option for everyone. Generally speaking, Charlotte is a very affordable Southern city to travel to! Of course hotel prices (especially those in Uptown) can increase on weekends, holidays, or if there are major events in the city, but overall you can get a lot of bang for your buck here as far as lodging is concerned. Hilton Executive Park (Tyvola): This is where my friends and I stayed on a recent girls' trip, and I can't recommend it enough. I booked two rooms for all of us... and the rate for Friday-Sunday was just under $90 a night!! That's unreal! This hotel is located right off I-77 an easy 10-15 minute drive from Uptown Charlotte, South End, and SouthPark, which are three neighborhoods that you'd probably want to spend time in for girls' trip activities. It's also very close to the South Carolina state line. My friends and I were impressed with how large and comfortable the rooms were for the rate we paid, and the lobby was very swanky as well! Probably one of the best value hotels I've ever stayed in for the high quality. There are a number of Hiltons in Charlotte- but I think that this particular one offers such great rates because it's a little outside Uptown. Courtyard Charlotte SouthPark (SouthPark): I've stayed here numerous times with my parents when I would move into or out of school at the start and end of each year in college! My university was very close to the SouthPark area, and this is one of the most affordable hotels in that area. It's a great value, and also pretty nice! It's also right by SouthPark Mall and all of the great restaurants in that neighborhood. Le Meridien Charlotte (Uptown): This is my favorite hotel in Charlotte! I did a staycation there back in 2016, which was a blast. (The pictures in the photo above are from Le Meridien!) Another big perk is that my favorite rooftop bar, City Lights, is on top of the hotel! This hotel is on the outskirts of Uptown so it offers incredible views of the city, but is still close enough that everything in Uptown is walking distance. Uptown hotel prices can jump on some weekends- but you can find good deals at this hotel. I love the funky, modern decor. It's worth it to splurge a little more and book a room with Uptown views! Courtyard Charlotte City Center (Uptown): This is the only hotel I'm featuring that I haven't actually spent a night in- but I have spent time here! I was in my friend Perrin's wedding in 2017, and she used a room in this hotel for all of the bridesmaids to get ready for the day's festivities. If you really want to be IN Uptown Charlotte- this is the hotel! It's literally in the center of Charlotte, and walking distance to all Uptown attractions. It definitely has a big-city feel. Charlotte Marriott SouthPark (SouthPark): This is probably the nicest hotel that I've stayed at in Charlotte. My parents and extended family all stayed here during my college graduation weekend, and I spent a couple nights with all of them since the hotel was so nice! This hotel boasts a stunning lobby and large, plush rooms. It's centrally located to all of the SouthPark neighborhood attractions as well. I personally have actually never stayed in an AirBNB, but I know there are tons in Charlotte! If there's a smaller or more specific part of the city or suburbs that you'd like to stay in, that's definitely an option to look into as well. Next week I'll be wrapping up the Charlotte Travel Guides by sharing my favorite shopping and activities in the city and surrounding areas! Girl I have been wanting to visit NC for quite awhile now! I am RELIEVED there are budget friendly hotels, as I may be making the trek down soon! I can't wait to hear more about NC on your blog! yes i love Charlotte but havent been there in years!i def need to get there and love all the friendly hotels- ill be taking you guide! I’ve never been to Charlotte but would love to stay here so it’s great to know that there’s affordable hotels to make the dream a reality! Le Meridien sounds fab, especially the roof top bar! My brother in law just moved there so we might need these recommendations when we visit! It seems like there are so many great options! Wanting to stay at the Meridien so much! I've heard great things and this got me even more excited! my mom will be working in Charlotte for a bit of this year, so really looking forward to getting to explore more! Nice recommendation for those who are traveling to this part of North Carolina! I really need to come visit NC!!! I've heard so many great things about Charlotte. That's awesome that you were able to book a girls trip with the hotel room only being $90 a night!!! That's a huge plus! These are such great suggestions! I would love to visit. I almost spent a night in Charlotte once but managed to catch a flight out. Great to have these recommendations!